I’m glad we have copy and paste on iOS, but highlighting text on the iPhone can be a pain. To select text normally, you have to move your finger off the virtual keyboard and press it over a word, and then drag the blue tabs until they cover the letters you want. Apple’s system is intuitive, but it takes time, it can be finicky, and disrupts my workflow. SwipeSelection allows you to quickly move the cursor and make selections while keeping your fingers on the virtual keyboard. With SwipeSelection installed, you can move the cursor by swiping a finger across the virtual keyboard and select by swiping a finger forward across the shift key. The selection is smooth and should feel natural to those familiar with selecting text on a desktop computer using shift and the arrow keys. Unfortunately it seems there are some apps that don’t support SwipeSelection. Most of the apps I have tested function as with the tweak as expected. I had no issue with selecting editable text in Facebook, Skype chat, Mobile Safari, or Apple’s default Note app. Swiping on the keyboard in Evernote (a popular note taking service) does nothing, and there may be other apps which, for some reason, aren’t compatible. Another limitation is that this method can’t be used to select non-editable text, which I find Apple’s default selection method has the most difficulty with. If you don’t do most of your mobile text editing in Evernote, try out SwipeSelection. 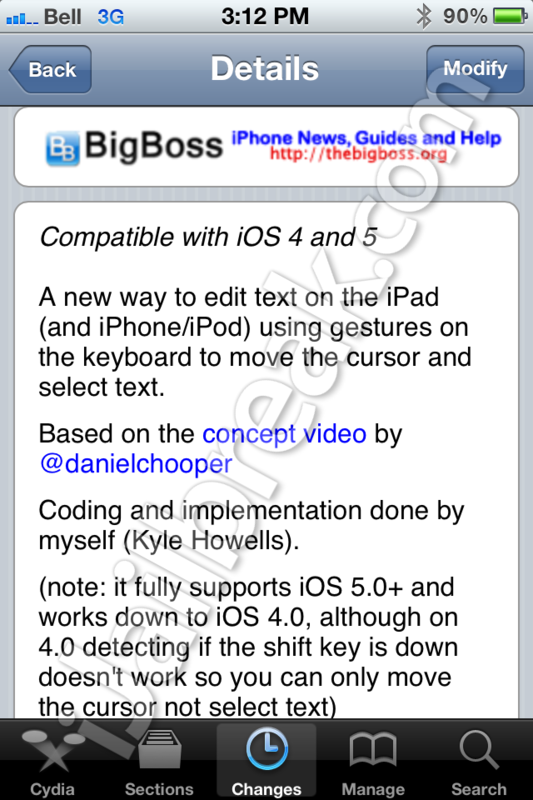 It’s available in the BigBoss repo for FREE, and is compatible with iDevices running iOS 5 (and provides some limited functionality for devices running iOS 4). Should Apple implement this keyboard tweak in iOS 6? Let us know in the comments section. its a shame apple does not come with this 1st. got the tweak installed n its really cool! how to make it pop out once finish selecting the required words? I cand find it in my Bigboss repo…why? Am I the only one who can’t mark text without including the letter I begin marking with? Eg. I start marking from K on the keyboard, then when I’ve marked as much as I wanted I release shift and start typing, but the K comes in front of whatever I start typing. It’s the same if I just move around without shift btw. Could it be interference with shift+delete or perhaps even color keyboard? I can’t find the link anywhere to download swipeselection…can anyone help? I love it, but I can’t seem to use the Caps button for quick selection of numbers and symbols after installing this tweak. :(. Its awesome. Thanks to the dev. SwipeSelection tweak doesn’t work with iSwipe tweak. Is swipe selection available for ipad ios 7?